Thanks Fontana!! and to RFF! Best I've been able to grab is people posting that AusTAR went to Bali in the first leg, most likely information take from this very thread. I have two sources re the flights taken, one on board with them. After that...nada. Just a thought, if the contestants haven't been spotted in Bali, they may have headed over to one of the Gili Islands? Gili Trawangan, Gili Meno or Gili Air. "I think I have mentioned here previously I visit my cousin and friends over in Bali and Gili Trawangan a couple of times a year, just got off the phone after speaking with her. The Amazing Race folks arrived over at Gilli T yesterday [Saturday??] and filmed just a few metres away from her Villa, on the beach, outside a small Pizza Cafe. She asked the producers which show they were filming and they said it was a Corporate promo, which she noted was not obviously the case. The team members were all very calm and from what she could see they were *counting out cash, contained in suitcases*"
I PM'd the user who is going to try get more information for us. "One thing she did mention was that the production crew hired *all* the horse and carts on the island. (There is no motor transport whatsoever on Gilli T, it is either bike, walk or the horse and cart). 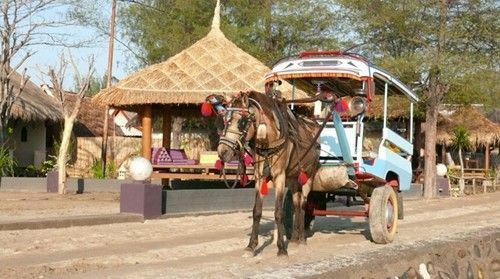 So I am guessing here, that the teams will be seen travelling from when they hop off the boat in the traditional horse and carts. I just did a quick search, here is a [generic] photo - "
Is that a generic horse/cart photo, or is that a racer pic? And could you send me the link please or post it if not private? Hope there are some real photos coming soon. The pony carts are known as Cidomos. Activities the racers could have done on the Island include: Diving, Kayaking (between Islands) and horse riding. awwww...we were hoping you would have the fun of seeing them!! Thanks caper!! She kindly responded right away! saw 2 teams of participants in lcct 2day, which is on 8 nov 2010 at around 5am. They were at the air asia ticketing booth. when i was there at about 4.50am, there were already there waiting for the counters to open. There was a long queue, but both teams are standing at the most front of the queue. one of the team is formed by 2 girls, and the other team is a couple. There was a camera man with them and another asian guy, which i am not sure whether he is a malaysian. the girl team: both are blonds, and one of the girls is very tall. The shorter gal wearing red sweater, with her hair braided and was very anxious, while the taller girl was wearing a green sweater (if i remember correctly), with her hair tied. Both of them looked younger than the other team. for the couple, i dont quite remember about them, but the female was wearing a pink jacket if i am not mistaken. and when the counters open at about 5.10am, both teams purchase tickets to Ho Chi Minh, and the flight was at 10.35am. LCCT is an airport specially for Air Asia, and it is an Air Asia ticketing booth, so both team should be using Air Asia. Yes!!!! Way to go Peach!!! "they were checked in on jetstar today to bali , only one pair got on an earlier service ( which may have been delayed) their next destination is malaysia or vietnam"
"I was able to speak to my relative over on Gili T. She has of course, heard of TAR and viewed a few episodes when visiting back home here or the States, but is not a regular viewer. Taking the above into consideration, she was of course interested when filming of TAR was taking place on the Island, but perhaps not nearluy as attentive as yourself or other enthusiasts of the series would be. I hope you are not too disappointed with the minimal information, she was able to provide to me. I asked if she or anyone else took any photo’s and she said she didn’t believe so. The filming took approximately 5 hours. During this time each team sat in their own Beruga (see photo below). They also had a black board|chalk, plus a briefcase which was filled with 2000 rupiah notes (I think each 2000Rp note is equivalent to around 40cents). Each team appeared to be counting the notes and writing on the blackboard. (They were *not* rushed, stressed and/or anyway flustered during the above task, which surprised my relative). She did not see the Host (Grant). They left the above location in separate cidomo’s (again in an orderly manner|no rushing). I asked her to describe the team members, she was very vague in this respect, noting she thought there was –2 male slightly overweight twins! A typical mum and dad a couple of good looking girls, 2 guys etc. There were 2 helicopters hovering overhead on two or three occasions. There was an Australian Crew plus a local Indonesian Crew helping with filming. The Producers hired *all* the Cidomo’s on the Island. She has no idea where they went after the above filming. Filming took place towards the north end of the Island. The Pizza Oven restaurant on Gilli T.
These Beruga’s were actually used by teams ^^"
Credit to Daltrim for the pics! 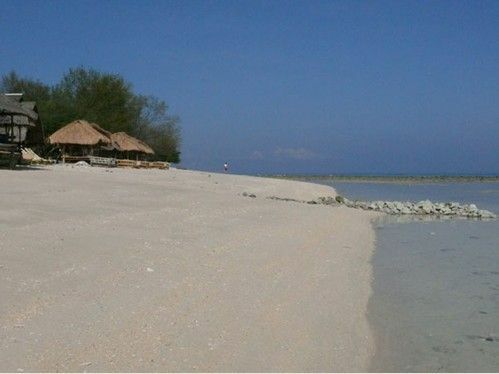 Route Info: Make your way to Gili Trawangan Island? Route Info: Travel/ride on cidomos? Task: Count out 2000 rupiah in notes? Leg Two: Bali to Vietnam? Route Info: Make your way to Ho Chi Minh City? Appears to be the Imperial City. Anyone speak Finnish and can help interrogate the owner of the photo? Please PM me. Could this team spotted in Hue be the Young blonde team? while the taller girl was wearing a green sweater (if i remember correctly), with her hair tied. The girl in the foreground is tall-ish, she looks as if she matches the production guy tailing them height-wise. And she does have her hair tied back. I have just heard back from someone who saw the teams on the way to Bali...she has descriptions for "most" and pics and will share when she gets back from her trip! "I walked through the set of Australia's Amazing Race tonight in the casino. The task was baccarat. Pretty cool to see it live! #Macau"